February 2016 – This is a blog. I write it. Abhishek Kapoor’s adaptation of Charles Dickens’ Great Expectations is set in Kashmir. At first, it seems a cinematographic choice but slowly certain themes emerge. The desolate beauty of the landscape, the changes in the season and the almost painful need for beauty and freedom that the characters express comes to us through the land just as it does through the narrative. Noor (Mohammed Abrar) meets Firdaus (Tunisha Sharma) when he accompanies his brother in-law Junaid (Rayees Mohi-ud-din) to Begum Hazrat’s (Tabu) mansion. For him she seems like a dream riding a horse, free, imperious. Their relationship from their first meeting emphasises the class divide. He is eventually made her playmate and it is increasingly apparent that he is obsessed with her. Begum Hazrat soon parts them and commands him to become worthy of Firdaus. Years later, when Noor (Aditya Roy Kapur) is busy honing his skills at art, he receives an art scholarship from an unknown benefactor and has to move to Delhi. He knows from prior information that Fridaus (Katrina Kaif) is in Delhi as well. So he sees this as an opportunity to better his lot and inhabit her world. What becomes central to this romance is the power play between the characters. Begum Hazrat, due to an ill-fated romance tries to take revenge on fate and people by playing Noor and Firdaus against each other. Firdaus, having been trained by her mother, is unpredictable in her affections towards Noor. And it is not just the control the two of them exert on him but ‘fate’ itself seems to be controlling him and forcing him to feel obliged for any baksheesh (alms/bribe) he receives. Does the political situation actually figure in the story? It certainly has the socio-economic concerns of Dickens’ novel and strangely enough, the political implications of the land do figure. Firdaus is to be married to Bilal (Rahul Bhat), the next governor in Pakistan. And this is where the line from the trailer enters – “Doodh maangoge toh Kheer denge, Kashmir maangoge toh cheer denge” – If you ask for milk, we will give you pudding, if you ask for Kashmir we will give you a thrashing. Noor sees Fridaus as Kashmir – pure and beautiful. Then if Bilal is Pakistan, is he India? Or is he also Kashmir? He after all admits to be living in the past. Firdaus for him represents a way of life in Kashmir that is open only to those who have the wealth to remain unconstrained. But there is a fallacy in this, because Begum Hazrat controls Firdaus so everything has become tainted. Most of the people Noor meets at Delhi are Kashmiri in origin. And while he feels slightly overwhelmed in the beginning with the grandeur, he fits in. If anything, it becomes his space. Aarif (Kunal Khyaan) does not wish to return to Kashmir and neither do most of the others because for all its beauty, they would choose freedom instead. Rather than hearing stories of a Kashmir that was liberal, they would rather live liberated lives. Most of the characters live in the past. Begum Hazrat, unable to find closure, continues to live in a past of abandonment. Salman (Talat Azmi), Bilal’s father, also never forgets Hazrat who was once his fiancée despite the fact that she left him. Having seen a previous adaptation of Great Expectations, there was personally no element of surprise but the film is nevertheless a good screen adaptation. All the characters were well cast; in fact, the younger selves of Noor, Firdaus, Hazrat (Aditi Rao Hydari) are uncannily perfect. Tabu in fact has the done the dubbing for Aditi Rao Hydari with probably some pitch modifications to sound younger. Thus it retains authenticity in the film. However, Ajay Devgan was wasted in the film. His character of Abel Magwitch in Great Expectations had so much more to it. And yet it just wasn’t explored in this film. He was downsized to a plot device. The ending of the film, is tame to put it mildly. The whole film expects the narrative to reach a satisfying crescendo and that does not happen. The artwork and the cinematography were stirring; and the music and dialogues – poetic. 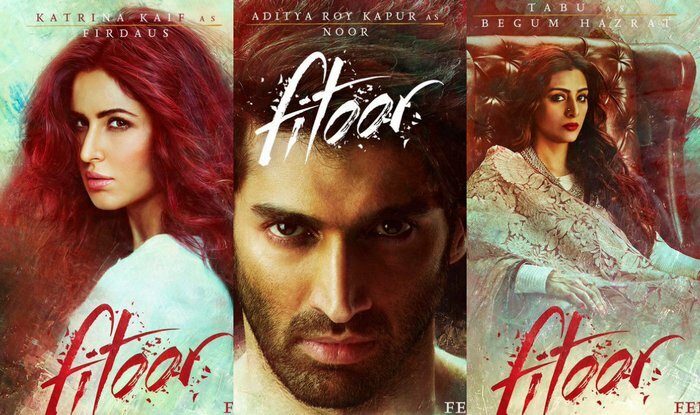 The title Fitoor means obsession/ passion/ insanity and it is most apparent in Noor and Hazrat because the others hide it better. Yet it comes out in the restrained violence of Bilal; the longing in Salman and the loss in Junaid. Note: I was pleasantly surprised to see a friend and fellow actor Sameer Roy in the film. He plays a small role, that of the young Salman, but it was great seeing him in Fitoor. The scene opens and it looks suspiciously like a stage production, the lights slowly coming on, one after the other, to reveal an old man seated near a piano. Another person, dressed in a suit calls him out and he wheels himself out. The man now seated near the piano ready to play the music is Cole Porter and we realise that the old man in the wheelchair was Cole Porter as well. De-Lovely is a musical biography on Cole Porter that portrays his life, marriage, other relationships both professional and personal, and his career alongside his music. 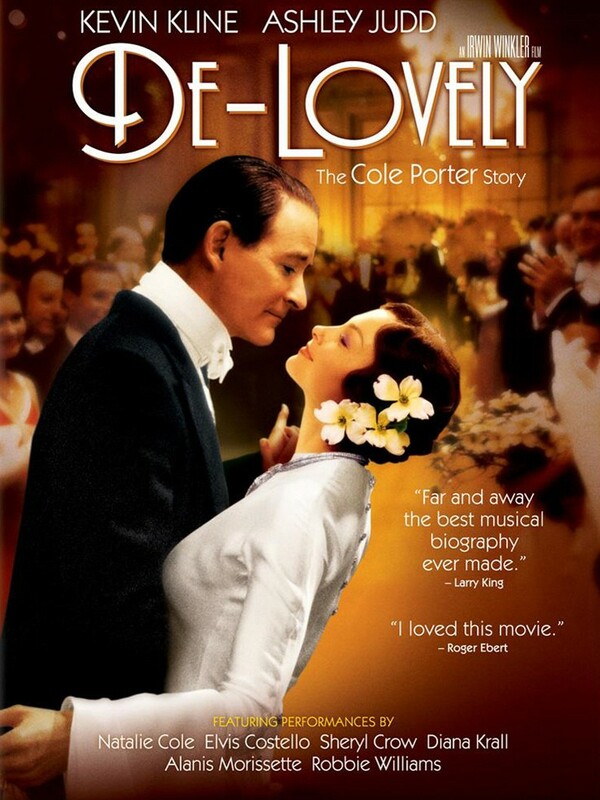 We see Cole Porter (Kevin Kline) meeting Linda Lee (Ashley Judd) and deciding to marry. There’s was an advantageous marriage because Linda, much like a manager does everything to promote his career. She believes implicitly in his music and his music’s ability to move people. She also uses the trajectory of his career to take him away from relationships she does not approve. It is a strange portrait of a marriage, the usual ups and downs but also their rather particularly different dynamics, with his interest in men and her tacit acknowledgment of it. She wants him to be discreet but he is too flamboyant in his affections. Yet he cares deeply for her and she is in many ways central to his music. The film is like a meta-narrative with the older Cole Porter feeling the need to portray things differently or finding the act of watching his life played out before him too disturbing. The director – Angel Gabriel (Jonathan Pryce) however, categorically tells him that he cannot interfere because his story will be reinterpreted based on what others feel. Also, once a story is in the public domain (and sometimes even when it’s not) one can take artistic liberties with a narrative. This is true of the film and every biopic. However, while making the biography a review by the older self of the real-life persona is a refreshing take, it makes it hard for the viewer to relate to the characters on the screen because of the alienating effect of seeing the older Cole Porter questioning his life. It is nevertheless, more realistic in its portrayal than his contemporaries who romanticised his story. In fact, there is a scene in the film wherein Cole and Linda watch a private screening of Night and Day and wryly comment on how sugary a portrayal it is and yet how it is flattering to have yourself immortalised as Cary Grant. One must also remember Brecht who spoke about how the alienation effect in theatre was necessary to keep the audience from being sucked into the story. Instead, they should reason and question what they are seeing. So also here, while watching De-Lovely one can’t help but ponder over their relationship and wonder why Cole and Linda chose to be with each other. It is thus a unique portrayal of a person’s life through their own eyes and their music. De-Lovely has Cole Porter’s music performed by contemporary singers who play the role of club singers and actors in his productions, it shows how contemporary and popular his music still is. A special mention: the make-up. It is very realistically done and shows the aging of the characters really well.